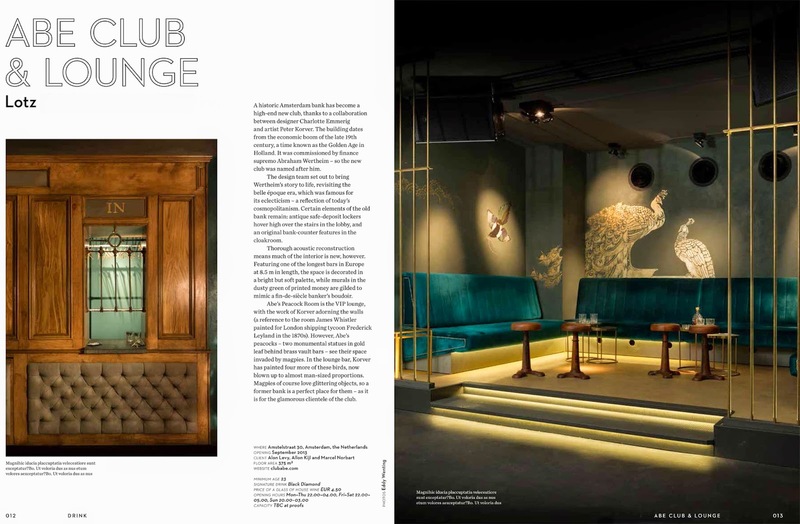 A historic Amsterdam bank has become a high-end new club, thanks to a collaboration between designer Charlotte Emmerig and artist Peter Korver. The building dates from the economic boom of the late 19th century, a time also known as the Gilded Age. It was commissioned by finance supremo Abraham Wertheim – so the new club was named after him. 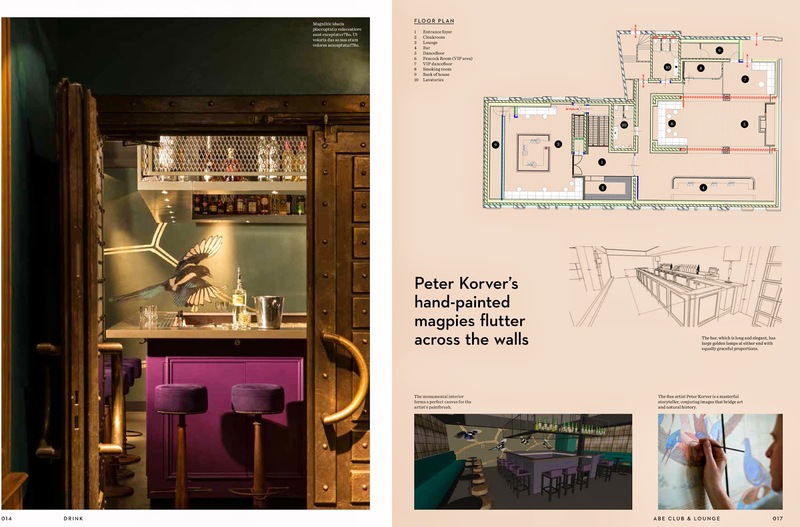 The design team set out to bring Wertheim’s story to life, revisiting the belle époque era, which is known for its eclecticism – a reflection of today’s cosmopolitanism. Certain elements of the old bank remain: antique safe-deposit lockers hover high over the stairs in the lobby, and an original bank-counter features in the cloakroom. Thorough acoustic reconstruction means much of the interior is new, however. 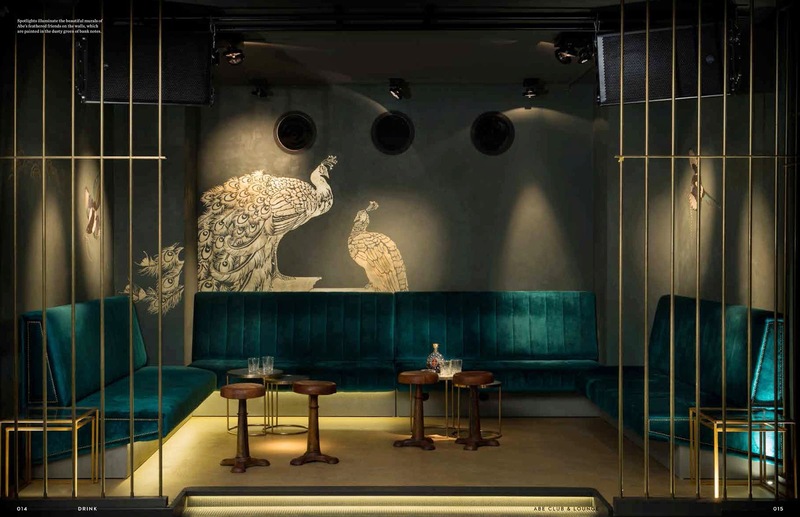 Featuring one of the longest bars in Europe at 8.5 m in length, the space is decorated in a bright but soft palette, while murals in the dusty green of printed money are gilded to mimic a fin-de-siècle banker’s boudoir. Abe’s Peacock Room is the VIP lounge, with the work of Korver adorning the walls (a reference to the room James Whistler painted for London shipping tycoon Frederick Leyland in the 1870s). However, Abe’s peacocks – two monumental statues in gold leaf behind brass vault bars – see their space invaded by magpies. In the lounge bar, Korver has painted four more of these birds, now blown up to almost man-sized proportions. 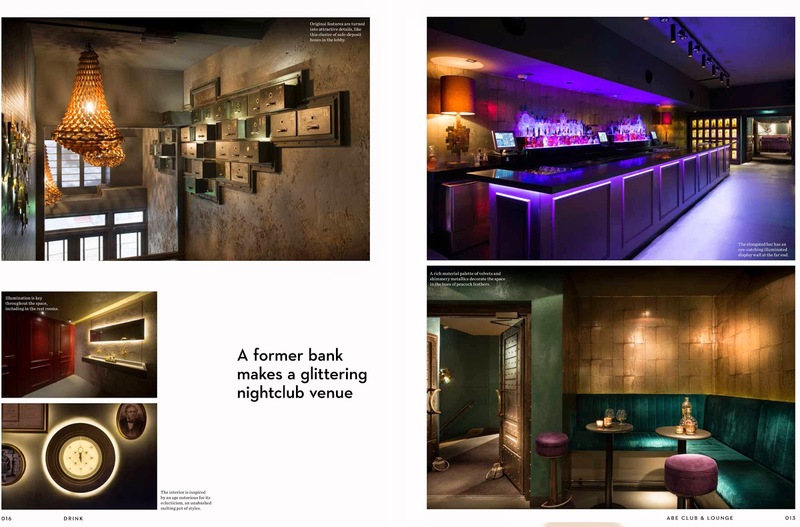 Magpies of course love glittering objects, so a former bank is a perfect place for them – as it is for the glamorous clientele of the club.